"People think we are mad. We think they are insane to endure such humdrum lives. " A good friend gives me the best birthday gift I have ever received. On February 18th, she and I jump out of a perfectly good airplane at 11,000 feet. WE WENT SKY-DIVING!!! It is one of the peak experiences of my life. Here is how it happens: We pay $220 for a full day of training. The training consists of being shown all the parachute gear and how it operates. Next, we are suspended from a parachute harness to learn how to pull levers which control the direction and braking of the parachute as we fall, and what to do if the main chute fails to open. Then we get into a "skeleton" airplane (a cockpit with no wings or engine) with two guides who go through the routine of getting out onto the wing strut and jumping. Then we are suspended from another harness that hangs us parallel to the ground while we practice looking at our altimeter and pulling our rip-cord. We practice these things until they become second-nature. There are a large number of safety features to significantly reduce the chance of death or injury (we still have to sign a waiver, though, that says in eight different ways that they have no insurance, and that I agree to assume all risks for engaging in an activity that can result in serious injury or death). For example, on our first few jumps, two trainers hold onto you during your "freefall" to make sure we remember what to do while we are falling. Also, the field we land in is HUGE, so there are few trees, roads, or power lines to fall into. A guide speaks to us with a radio transmitter on the ground to direct us to where to land. In addition, our back-up parachute is nearly fail-safe. If something goes wrong with the main chute, there are two or three ways to release the expert-packed back-up. Even if we are knocked unconscious, or are so petrified that we cannot pull our rip-cord, though, there is a device on our chest that automatically releases the back-up chute at 1,000 feet. I disagreed with at least one of the recommended safety measures, however. One of the trainers said that if, while we are falling, we think there is anything wrong with the main chute, cut it away and go to the back-up chute. I have a problem with this strategy. What if there is a problem with the back-up??? Do I really want to get rid of the main chute if there is only a minor problem, and risk having something major go wrong with the back-up-which has no back-up??? Oh, well. Almost no one ever has to use the back-up. Unfortunately, when we go through the training, we are unable to jump at the end of the day because of windy weather. Instead, we must wait until the next weekend, which was extremely tough on my nerves. It is like a postponement of your execution date in the electric chair, or "walking the plank." After all the training, you just want to get it over with!! Finally, the day arrives. My friend goes first. I watch from the ground as the small plane releases her and her two trainers at 11,000 feet. They look like ants in my binoculars. She performs nearly perfectly. I am greatly impressed, since my friend is deathly afraid of such things as walking downhill during a hike. It must have taken all of her courage—and then some—to sky-dive. But like me, she has always wanted to sky-dive, and we are both adventurous enough to do it. Then my turn comes. I suit up (Looking like Chuck Yeager. See photo.) and rather calmly walk to the small Cessna plane on the tarmac. Five of us packed into a plane barely big enough to hold three people. It takes us about 20 minutes to get to 11,000 feet, and I find I am less nervous on the ride up than in the waiting over the past week. (It is interesting to watch the landscape below, and relaxing to joke with the trainers.) Finally, at the designated altitude, one of the trainers opens the plane door to see if we are over the jump area. 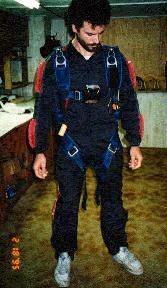 The engines of the plane are temporarily cut off, and the trainer turns to me and yells: "ARE YOU READY TO SKY-DIVE???" I am required to respond very loudly with a confident "YES!!!" so that the trainers know I am not so petrified that I will not be able to function when getting out of the plane. If I don't respond strongly, they apparently must bring me back to the ground. Next, the trainer who asked me if I was ready gets out onto the strut under the wing. I must then put my feet out on the strut, turn back to the other trainer for an O.K. signal, then place your hands on the wing support bar. I am now in a semi-crouching position out on the strut, as the second trainer gets out onto the other side of the strut (I am now sandwiched between them, looking down at the ground 11,000 feet below, and feeling the hurricane-like 80 mile-per-hour wind that I had earlier thought was going to pull me off the strut). Everything for the next 60 seconds is a fast-paced blur. I am now on auto-pilot. Too terrified to think. Somehow, I turn to the trainer on the left and say "CHECK IN!!" I turn to the other trainer and yell "CHECK OUT!!" Then, in a rocking motion on the strut, I yell "READY!! SET!! GO!!!!!!!!!" I let go of the wing support. I am falling away from the plane with the two trainers hopefully clinging onto me (horrifyingly, one of them accidentally lost his grip of me!!). For the next few seconds, I am almost unconscious because of the sensory overload. Regaining my senses, I realize I need to go through the next steps during the 40-second free-fall (which seems like it takes about 5 seconds). First, I must arch my back and spread out my arms and legs to keep from rolling out of control during free-fall. Then I must check my altimeter and tell the trainer on the right when I am at 9,000 feet, after which I turn to the other trainer to nod that I am O.K. Next, I do my first of two "practice" cord pulls, which involves (1) looking at my rip-cord; (2) simultaneously moving my left hand over my head while my right hand moves to the rip-cord (to prevent myself from rolling); and (3) doing a practice pull. I must also look down at my altimeter every few seconds (not hard to remember, since I certainly do not want to fall too far beyond the point where I must pull my rip-cord). During this time, I am encouraged to look around, smile at my instructors, and pretend, frantically, that I am enjoying myself during the most frightening moments of my life (which is somewhat difficult for a beginner, although I managed it a bit, I was told later). Finally, at 5,500 feet, I flash "five-five" with my hands, signaling to my trainers that I am at 5,500 feet and are about to pull my rip-cord. I pull my cord. Immediately the chute opens and gently jerks me upright. I look up to make sure the chute is properly opened. It is OKAY!! Pure relief almost overwhelms me. I begin about four minutes of pure bliss. Nothing I have ever experienced is as joyous as what I feel at this moment. 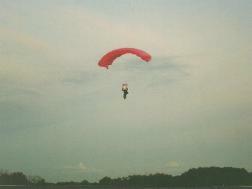 The chute is rectangular, which gives me incredible maneuverability. I can make turns and complete circles almost effortlessly and with great precision. I look around leisurely at the landscape 4,000 feet below. I feel as if I am in suspended animation. Everything is silent and peaceful. There is nothing anywhere near me. Total isolation and relaxation. The setting sun on the distant horizon was a spectacular bonus. No more fear, as my chute is safely open. I am enormously relieved. I now know that I will not die. Instead, I have found the courage to enjoy something spectacular that few are able to experience. Twice during this period I say out loud to myself—even though no one was around to hear me—"THIS IS INCREDIBLE!!" As Garrett Soden pointed out in his book, Falling (2003), "…one thing remains clear: the sensation of falling stirs up intense emotions. Falling can feel like rapture…being on the knife-edge of the sensation makes [you] feel alive the way no other experience can." My landing is so soft that a two-year old child could have handled it. By the way. A big reason my friend gave me this gift was that I told her last year that a few friends and I almost jumped when one of them was having his 40th birthday (the other friend said no one can turn 40 until they had sky-dived). That fell through, but my friend figured no one should turn 35 till they sky-dived. I told her afterwards I was overjoyed she didn't let me. What a wonderful experience. Oh, and one last thing: "If at first you don't succeed, don't try skydiving..." (just kidding).